Three weeks ago today, my son Brendan Bjorn had a long awaited spinal fusion. After waiting over 16 months on an *urgent* spinal fusion waitlist, growing worse each week as his body crushed in upon itself, he underwent the major surgery in attempts to get things straight – his back, his lungs, his intestines, his body as a whole. Three weeks later, he is still in hospital after a number of complications. Some of the complications weren’t totally unexpected considering his medically complex condition. Having said that, no one really expected he’d still be in hospital at this stage with unresolved concerns and no discharge date in sight. Thankfully, his surgery site is healing well now after a bout of infection. His digestive system, however, isn’t cooperating with recovery. He’s on TPN (nutrition via IV) and has had severe diarrhea for these past 3 weeks since his operation. He won’t be going home until he’s back on his formula. It’s that simple. I know life’s path isn’t always a straight one, but at this point, I could do with a few things getting straight. The sudden turns and unforeseen detours on this journey make for some very tiresome traveling. I’ll know by the end of the week if the bungalow we intend to buy will actually come through or not. If it doesn’t come through, then it means the search and buying process will have to start all over. And to think that for Brendan to come home to me and his brother we need to be moved into a suitable bungalow required for his complex medical care has left my head anything but straight. One of the hardest parts about this journey is living each day in the moment while also needing to plan ahead. Make that plan ahead with the addition of a Plan B and maybe even a Plan C also in mind. 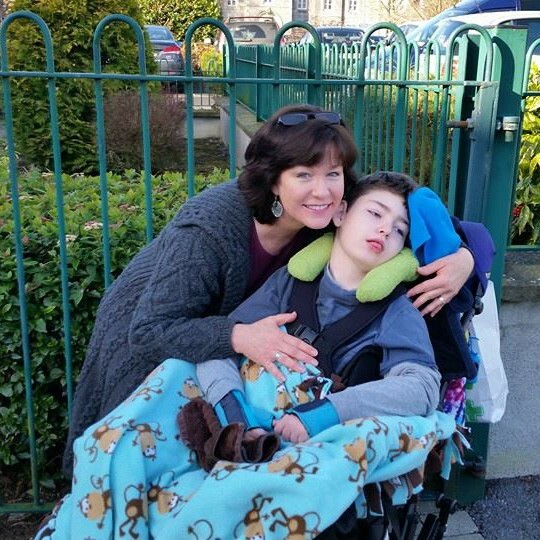 Parents with special angels like Brendan are required to remain ever vigilant when it comes to organising such complex needs. We desperately try to keep things straight because our child’s life often literally depends on our ability to do so. If you aren’t on this journey but know someone who is, be patient with them as they work to try to get things straight. It may mean they have to fight and advocate for their child’s unique needs. You may think they are complaining too much or focusing on what is wrong rather than what is going right. Please understand that to get things straight, and indeed to maybe even save their child’s life, they must focus on what needs to be improved to prevent the lack of improvement causing further harm to their child. Our path is anything but straight forward. As I look at the x-rays of my fragile son’s back, it seems surreal. Yet there it is, in black and white: the rods and the bolts holding his spine as straight as could be done. Such a mixture of emotions comes over me tonight as I examine the pictures. Gratefulness, relief and hope. Fear, sadness and anger. Emotions not all of you will understand. Emotions some of you may even judge. Emotions that will resonate with a number of you…those of you who share this path that’s not so straight. A tale of 2 boys, 2 weeks on. Two weeks ago today, Brendan Bjorn underwent a spinal fusion. Tonight, as I type this blog piece, I sit here in the dark of his hospital room on the bench which has become my bed. I’m wearing the Harry Potter pyjamas bought while with my younger son, Declan, while out spending some rare one on one time with him awhile back. And I’ve been crying. In fact, not long ago, one of the nurses came in and discovered me sitting here doing just that, much to my embarrassment. I’m supposed to be stronger than this. About an hour ago, my long time friend of over 2 decades – who also happens to be Declan’s Godmother – sent me 2 photos of Declan sporting a new haircut and new outfit. Even new runners. He looks smashing! I have 2 incredibly handsome boys (I say in a mother’s unbiased tone). I don’t know if many will understand why I cried. There are actually a number of reasons: I miss him terribly; I wish I could afford to pay for a barber every month – rather than the not so great home haircuts I give; I wish I could afford to buy him new clothes and runners from a sports shop instead of a grocery store; I wish I could be in 2 places at once with both boys as they both need me in such different but equally important of ways. I wish so much. And sometimes, wishing hurts when those wishes can’t be fulfilled. Directly in front of me at this moment, while I sit here in the dark, I see the monitor I’ve been watching with worry all day. His O2 sat remarkably great at 100%. That’s even better than mine! It’s the heart rate today which we are keeping a close eye on. The green glow of a too low rate in the mid-50s shines out at me. Brendan is moaning and grinding his teeth, clearly feeling miserable. Most of the day he’s been asleep, not even able to easily rouse him. Far too pale. Low temperature (which tonight turned into a fever). Continued issues with his bowel movements since his surgery 2 weeks ago. X-ray, blood tests, ECG, physical exams – all done today with no telltale results. We are all thinking maybe it is a lack of nutrients as he hasn’t been on his formula feeds since last week because of the GI issues. But as he continues to have the GI issues, they are starting him on IV nutrition called TPN. And tomorrow, if the TPN is to continue for more than a day, they will once again place a new central line as TPN is hard on the veins. Yet another infection risk. Yet another worry. My heart is in two places tonight. One half rests with the son only a few feet away from me, who thankfully is now fast asleep. The other half of my heart rests with the son who wants to be here with his mother and brother but simply cannot be. Today, my precious, fragile, beautiful first born son, Brendan Bjorn, turns 14 years old. And I am in awe of him. I know many parents might say that about their child. We are certainly not an objective group. But I truly am in awe of my son. Despite all of his challenges, the physical pain, the hardships – he loves. He is love. He exudes love as he looks up at me and that smile grows ever bigger while his blue eyes work their way into a smiling squint. And you can just feel the unconditional love of the angel that is him. Yesterday, I made a video (see here) to celebrate his journey thus far. As I rummaged through the plastic storage box which holds memories from his early days, I was brought to my knees. My old journal that I started on January 30, 2004 – the day I found out I was pregnant with him. Photos of me every month as I grew bigger with a child I had no idea would take me on this journey. I still wish that I could look back at those photos and have it not be bittersweet, but rather just be sweet. But, it isn’t. After 4 miscarriages, to give birth to a child that the doctor tells you is perfectly healthy, is total elation! But, to look back at those photos 14 years later – with the often cruel wisdom of hindsight – and see your former self reflected back at you now…it is different. It is bittersweet. Because the me from today knows what the me from that glorious day didn’t know: That within a month’s time, my world would come crashing down as my perfectly healthy baby boy was diagnosed with severe brain damage from congenital CMV (cytomegalovirus). Today is a new day. My warrior angel Brendan Bjorn lies sleeping peacefully in the room next to me as I type out my thoughts in this blog. I will soon go into his room, give him the morning round of kisses and cuddles, and receive that gift that is Brendan. Like I said above, it is me who receives the biggest gift today. Later, his brother Declan and I will bring in his balloons (which are absolutely huge!) and sing happy birthday to the other half of our hearts…and I will continue to mask my worry and fear that how in a week from today, Brendan will be undergoing his biggest battle yet in the form of a spinal fusion. Yes, today is about celebration! I wish all of you reading this could feel the love in the room that he radiates to all near him. Hopefully the birthday video will give you all a glimpse into the blessing that is Brendan Bjorn. Happy 14th birthday, my angel, my baby boy, Brendan Bjorn!